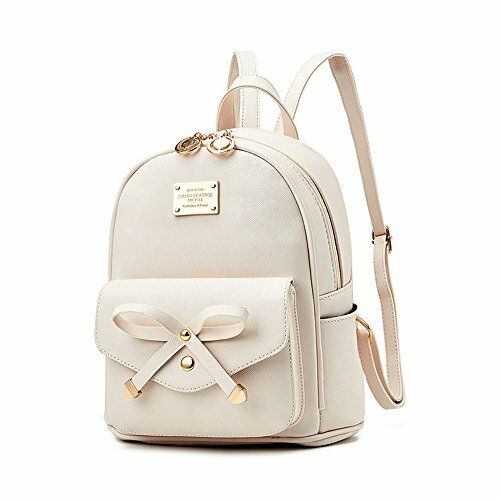 Girls Bowknot Cute Leather Backpack Mini Backpack Purse for Women | What Should I Say? Material: High Quality PU Leather, durable and easy to clean. Occasion: school, daily use, casual, travel. It's Simple, cute and feminine type of small bag. Modern design Ladies Backpacks and Travel multipurpose easy fit for shopping, promenade, and outing bag. The makes for a good backpack for an everyday use. 1. There may be a few smell on the bag once you got it, since it is in new condition and sealed packaged. You can put it in a ventilated place for a few hours, then the smell will fade away. 2. Color may vary slightly on actual item due to lighting effects/ environment, monitor brightness settings etc. 3. Regarding the size, please allow 1-2cm differences due to manual measurement. If you receive broken,damaged or wrong item,we will offer refund or resend in 24 hours after the customers send us a picture about the stuff you received. If for other reasons, we encourage our customer contact us, we will response in 24 hrs and do our best to service you. Material: High Quality PU Leather. Lining fabric: polyester. Structure: Zipper Closure, with adjustable shoulder straps. Multi Pockets: 1 main compartment, 1 front button pocket, 1 zipper back pocket, 2 side pockets; 1 interior phone pocket, 1 interior zipper pocket. Capacity: It's a cute mini backpack for girls and women, used for daily, shopping, day trips and short travel. It can hold your wallets, keys, cell phones, makeups and other small accessories and stuffs, but it cannot fit for iPad and laptop. Cute Backpack for Teen Girls: it's a great gift for also girls and women. Mini size and bowknot decor make you look chic and fashion. If you have any questions about this product by I IHAYNER, contact us by completing and submitting the form below. If you are looking for a specif part number, please include it with your message.